("LBJ" redirects here. For other uses, see LBJ (disambiguation).) Lyndon Baines Johnson (/ˈlɪndən ˈbeɪnz ˈdʒɒnsən/; August 27, 1908 – January 22, 1973), often referred to as LBJ, was an American politician who served as the 36th President of the United States from 1963 to 1969, assuming the office after serving as the 37th Vice President of the United States under President John F. Kennedy, from 1961 to 1963. Johnson was a Democrat from Texas, who served as a United States Representative from 1937 to 1949 and as a United States Senator from 1949 to 1961. He spent six years as Senate Majority Leader, two as Senate Minority Leader, and two as Senate Majority Whip. Johnson ran for the Democratic nomination in the 1960 presidential election. Although unsuccessful, he was chosen by Senator John F. Kennedy of Massachusetts to be his running mate. They went on to win a close election over Richard Nixon and Henry Cabot Lodge. Johnson was sworn in as Vice President on January 20, 1961. Two years and ten months later, on November 22, 1963, Johnson succeeded Kennedy as President following the latter's assassination. He ran for a full term in the 1964 election, winning by a landslide over Republican opponent Arizona Senator Barry Goldwater. He is one of only four people who have served as President, Vice President, Senator, and Representative. Johnson was renowned for his domineering, sometimes abrasive, personality and the "Johnson treatment"—his aggressive coercion of powerful politicians to advance legislation. Johnson designed the "Great Society" legislation upholding civil rights, public broadcasting, Medicare, Medicaid, aid to education, the arts, urban and rural development, public services, and his "War on Poverty". Assisted in part by a growing economy, the War on Poverty helped millions of Americans rise above the poverty line during Johnson's presidency. Civil rights bills signed by Johnson banned racial discrimination in public facilities, interstate commerce, the workplace, and housing; and the Voting Rights Act banned certain requirements in southern states used to disenfranchise African Americans. With the passage of the Immigration and Nationality Act of 1965, the country's immigration system was reformed and all racial origin quotas were removed (replaced by national origin quotas). Johnson escalated American involvement in the Vietnam War. In 1964, Congress passed the Gulf of Tonkin Resolution, which granted Johnson the power to use military force in Southeast Asia without having to ask for an official declaration of war. The number of American military personnel in Vietnam increased dramatically, from 16,000 advisors in non-combat roles in 1963, to 550,000 in early 1968, many in combat roles. American casualties soared and the peace process bogged down. Growing unease with the war stimulated a large, angry antiwar movement based especially on university campuses in the U.S. and abroad. Johnson faced further troubles when summer riots broke out in most major cities after 1965, and crime rates soared, as his opponents raised demands for "law and order" policies. While he began his presidency with widespread approval, support for Johnson declined as the public became upset with both the war and the growing violence at home. In 1968, the Democratic Party factionalized as antiwar elements denounced Johnson; he ended his bid for renomination after a disappointing finish in the New Hampshire primary. Republican Richard Nixon was elected to succeed him, as the New Deal coalition that had dominated presidential politics for 36 years collapsed. After he left office in January 1969, Johnson returned to his Texas ranch where he died of a heart attack at age 64 on January 22, 1973. Historians argue that Johnson's presidency marked the peak of modern liberalism in the United States after the New Deal era. Johnson is ranked favorably by some historians because of his domestic policies and the passage of many major laws, affecting civil rights, gun control, wilderness preservation, and Social Security. Hostess House. Mineral springs such as nearby Hancock Springs flow into Sulphur Creek, providing Lampasas with waters for recreation and health. The Hancock Springs tract became a fashionable tourist attraction and convention and encampment site in the late 19th century; by the 1880s, Lampasas advertised as “The Saratoga of the South.” In 1911, Dan Culver excavated a large open-air swimming pool in Hancock Park, utilizing spring-fed waters. Charles Baker and L. N. Little bought the property in 1929. Materials from the Texas Baptist Encampment dining hall were used to build the Hostess House south of the pool. The two-story frame building included a reception hall and changing room for the swimming pool, with an open-air dance platform on the second floor. Local bands and nationally known performers made the venue a popular destination. In 1936, the city of Lampasas bought the park, including the Hostess House. During World War II, the U.S. government leased Hancock Park as a recreation area, called Panther Park, for soldiers stationed at Camp Hood (later Fort Hood). In 1947, a golf course opened to the west and improvements to the Hostess House included a limestone veneer. After additional renovations to park facilities in 1948, Texas Governor Beauford Jester and U.S. 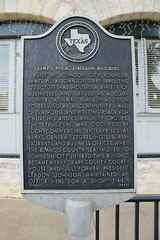 Congressman Lyndon Johnson attended a rededication ceremony. For many years following, the people of Lampasas continued to swim in the pool and attend dances and proms on the second floor. By the 1990s, the building had fallen into disrepair. 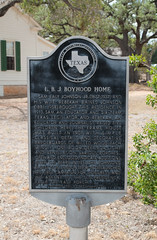 The city leased the building to the Oran Milo Roberts chapter of the Daughters of the Republic of Texas, which coordinated fundraising to renovate and restore the Hostess House and continue its public use.